The next Halo game will probably have the toughest enemies in series history, I learned this morning when I wasn't flying a spaceship (!) in Halo: Reach. But they'll only be tough if you force their hand. Bungie's Brian Jarrard played through part of the mid-game mission Long Night of Solace in an office in lower Manhattan today. He was recreating the truncated section of this September's big new Halo game that was also shown to attendees of E3 in Los Angeles. 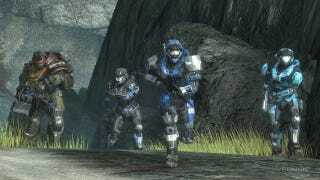 As Jarrard lead protagonist Noble 6 and his team through an on-foot battle on the surface of the planet Reach, he mentioned some of the campaign's features. One of the key points is the campaign's difficulty, which, in a change from recent Halo games, gets tougher if more than one person is playing it. For Halo 3 and last year's Halo 3: ODST, the difficulty of the game's enemies stayed the same no matter how many players joined the campaign for a co-op effort (up to four could play together). In Reach, Jarrard said, enemies will toughen if they face more players, exhibiting not just more damage resistance but getting smarter, more creatively using cover and generally being trickier foes. In the earlier games, Jarrard said, a four-player group had to switch to the high difficulty setting, Legendary, and activate some parameter-tweaking "skulls" to get a good challenge. In Reach, a player on Normal can bring three friends into the campaign and have the game adjust difficulty up for the group and then back down if that player resumes the campaign by themselves. Following Jarrard's logic, I asked if that meant that the enemies in Reach's Legendary difficulty would, during a four-player co-op campaign, be the toughest enemies ever in a Halo game? Or was Bungie dumbing difficulty down? I had it right the first time, Jarrard said. We can expect the enemies in four-player Legendary campaign to be the most devilish foes in a Halo game, i.e. a formidable challenge. Jarrard let me play the spaceship sequence, which was also truncated for demo purposes and immediately follows the ground part of Long Night of Solace. The flight controls are simple: analog sticks to steer and tilt, left bumper+sticks to roll or do a 180 "Immelman" maneuver, left trigger to accelerate, right trigger to fire; y-button to switch from machine guns to lock-on missiles (no cockpit view). Spaceship health regenerates. The mission involves a defense of a space station against an incoming Covenant armada. I shot at some enemy fighters until the space station was ready to join the fight. Then things got hectic and I engaged some larger craft. The space battle was fun, and not that different from some of the other aerial sequences in Halo. Jarrard said this will be the only spacecraft battle in the campaign and hopes it will benefit from one of the game's lead designers having worked on Crimson Skies. There is no spaceship mode in multiplayer, by the way, though Jarrard imagined that players could just shoot at each other in co-op if they really needed to. I learned a few other things about Reach while I was there. One stand-out: You can play Reach as a woman. Players choose the gender for protagonist Noble 6 before they start the campaign. How's that for a change of pace? We'll have more about Halo Reach here on Kotaku in the coming days. The game is set for a September 14 release.